Charities | Enuff with the Stuff – Sort Stow and Let It Go! Maria White, an Ashburn resident who owns Enuff With the Stuff, is using her job as a professional organizer to not only help her clients get in order but also to help the less fortunate around the world. White is one of many professional organizers in the National Association of Professional Organizers Washington, D.C., chapter who are collecting gently used shoes for Soles4Souls. She describes the effort and its rewards. Can you describe Soles4Souls for those who have never heard of it? Soles4Souls is a nonprofit organization in which individuals, schools, retailers, churches and other groups can collect and donate shoes to Soles4Souls, which eventually get sent around the world to countries like Honduras, Haiti, Uganda, Peru, the U.S. and more. They also encourage individuals to take part in the distribution trips to get involved handing out the shoes and see where and who is receiving the shoes first hand. How and why did you become involved in Soles4Souls? Soles4Souls was introduced to myself and the rest of my NAPO-WDC chapter by another organizer in our chapter who began his own collection challenge. He then introduced Soles4Souls to the rest of the NAPO National organization where they decided to partner up with each other to create a fun competition with NAPO members. Organizers are a natural fit for such a collection as we are always working with clients who have items to purge, and they feel so much better letting go knowing those items are going to a good cause. How does your job as a professional organizer tie into the goal of donating shoes to those who are underprivileged? In our profession, and in the society we live in, I see so much excess well beyond the basic needs. Shoes seem to be one of the things that people buy on impulse and then because they don’t fit right or don’t work for the outfit they intended to wear them with, they sit in the bottom of the closet collecting dust for eternity. What better way to help others than to purge gently used shoes that are no longer serving a purpose, but taking up precious closet space, then to give to those who can actually use those shoes. Some of the recipients have actually never owned a pair of shoes, so what a blessing those shoes will be. What is the National Association of Professional Organizers doing for the professional organizer who collects the most shoes/funds? NAPO is simply providing the encouragement to the individual organizers or chapters who are participating. Everyone posts their status on the NAPO Facebook page. We are currently at the 97,000 collected nationally so far. Soles4Souls is offering the trip for two to one of their destinations where they distribute the shoes. What would the trip to Haiti mean to you? This would be so huge for me because I have always wanted to take my children on a service trip to experience something outside of our cozy, perfect world in Loudoun County. Helping others has always been a part of who I am, so participating with this shoe collection has been something that I could share with all three of my children. They have been able to help me with providing hands-on assistance rubber-banding the shoes and counting them into the boxes, etc. What has been the hardest part of your mission to help Soles4Souls? The challenge I have now is finding a way to get so many shoes up to the New Jersey warehouse that volunteers its space to Soles4Souls. 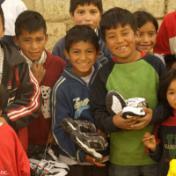 What has been the most rewarding thing you have gotten out of helping Soles4Souls? I love that my children have been involved in this project with me and have learned that there are people in the world who have never had a pair of shoes and will be so incredibly happy getting something so simple and basic that they themselves take for granted. Which area businesses have helped you so far with your campaign, and how have they helped? The following businesses helped by offering to have a collection box for the community to drop off shoes: Gutterman Services, Tailored Living, Insight Law, Blue Ridge Speech and Hearing, WINC FM, Samson Property, Sky Marble and Granite. 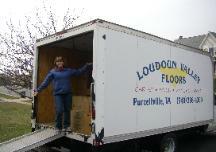 I was able to get boxes from All Star Movers and JK Moving. What can other businesses do to help your cause? I am in need of getting more than 100 boxes of shoes, more than 4,800 pairs, transported to New Jersey. As a business owner, why is it important to you to give back to nonprofits? I love giving back and in my profession, I feel a sense of obligation or responsibility to get the items that are no longer serving a purpose in a client’s home to where they can be appreciated once again and help someone who could maybe not otherwise purchase the items. Please Note: This is for informational purposes only. Enuff With The Stuff is no longer accepting shoes for Soles4Souls.